After a couple of days isolated for some rest and recreation in a ski hut in Norway, what is the first thing I do when I return home? Why, I check the mailbox of course, and not even the fact that our house was dead cold when I walked in could stop me from spending a few seconds with the lovely letter I had gotten. Ghosts in the heating system had to wait until I had at least a quick look at what was inside and smile happily! Right now I'm refueling with food, or something that bears a remote resemblence to it at least, and watching the heater closely as it makes up for quite a few hours of rest. In a moment I will dare to remove my thick thermo pants and park myself on the couch under a warming blanket to admire my pink envelope adorned with a wonderful Moomin stamp some more. And it's contents of course: two new additions to my tea bag collection. Yata! 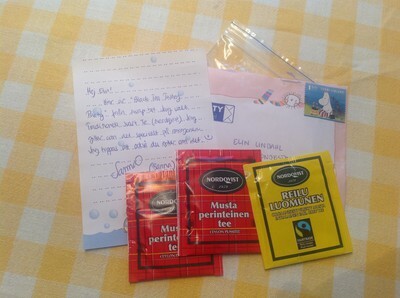 :D I'm very greatful to Sanna, the Finnish girl who's the sender of this little pack of happiness, who decided to add an extra bag although the specifications of the swap only required her to send two of the same kind.